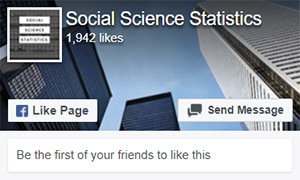 The Social Science Statistics web site is the work of just one person, who covers the cost of its development and upkeep out of his own pocket. Due to the popularity of the site, server costs alone run to nearly $2000.00 per year. If you have found the web site useful, and felt able to make a donation, this would be greatly appreciated. Your donation will help to secure the future of the site, and ensure the tools it contains remain free to everybody.